It’s been a busy week so far, even thought it’s already Wednesday I feel like it should be FRIDAY! Yesterday was crammed, with me on my feet all day. Woke up late, was running out the door to get to work on time. I did have a bowl of pumpkin oats, and packed a great lunch. Lousy picture but a great salad. 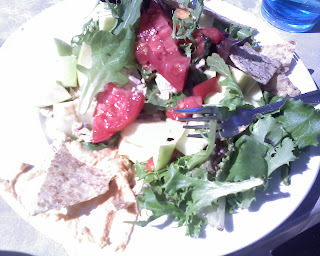 Salmon, organic greens, tomatoes,goat cheese, a granny apple, and some hummus with rice crackers on the side. Needless to say I didn’t have a moment to blog or sit! But it was a good day none the less. Today’s schedule is very similar, except I have a small get together with my women’s study at MY HOUSE tonight. Which means I need to clean this morning before I head to work, which is difficult when I still have company staying with us. The party is at 7pm and I get off at 6pm so it will be difficult to get anything done when I get home. So I am off to clean, hope you all are staying a float:) Oh and I am going to be trying a spin class with Rachel tomorrow morning wish me luck! I am taking today off from any exercise to let my body recuperate. P.S. I want to chop my hair off, women out there what do you think short or long? !